Treat your guests to the softness and quality of our deluxe, THREE-ply supersoft napkins. Available in bright white and a rainbow of colors, our dinner napkins help create the reception look you've dreamed of. Napkins are luncheon/dinner size, 6 1/2" square folded, and are printed FREE with your names, wedding date and a design and imprint color of your choice to carry on your wedding theme. Note for imprint color selection: We recommend choosing an imprint color that contrasts with your napkin color. On light color napkins, we recommend printing in a darker ink/foil color, and on dark napkins a lighter color. We cannot print in the same ink/foil color as the napkin color. I am beyond satisfied! My dinner napkins for my wedding are perfect and arrived so quickly! We wanted to get something that gave our wedding a little flare without spending a ton. These napkins surpass all of my expectations! They are high quality, color is perfect throughout the whole napkin and the design is almost embossed so it looks very professional and expensive. They're perfect--can't provide enough positive comments!! Process was painless, on time and arrived in great shape!! These arrived very quickly and look amazing! I cannot wait for our wedding! I still need to order more, but I will definitely be ordering the rest from here! Beautiful napkins, great quality, love them.. Very Nice, greast quality and very good price! Excellent customer service! Quality of napkins was excellent. Color was fantastic. Service was great as I had forgotten to order my napkins so went on line Sunday before the Saturday of my Wedding, spoke with someone from Customer Service as I was requesting 2-day delivery, I was assured that they would be there by that Wednesday, but I received them that Tuesday and was very grateful. The free setup is also available. Thank you and I will be giving your website to al that is in need of your service. I absolutely love these napkins and can't wait to use them at the wedding! The quality is outstanding and the design is gorgeous! Oh my, these napkins are elegant! They are of such a fine quality and the embossing is perfection. 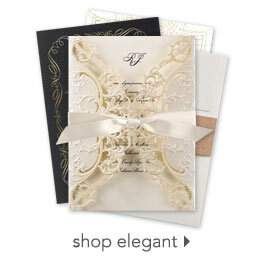 It matches the wedding invitations beautifully.The site was easy to use and the service was exceptionally fast. So very satisfied! I'm going to use the napkins at my wedding. They are Part of the table setting. I used the cocktail and dinner napkins at my wedding. The napkins were just as I wanted, pretty color and design, good quality and good price! We got these for our wedding reception-hasn't occurred yet. Everyone who has seen them loves them. I tested one out while eating chicken wings and it worked great!!! I ordered these and white with aqua print. These are very nice and the intertwined double hearts are perfect size for dinner napkins. They are very lovely. Thank you. I love these napkins good quality great price! I just wish the writing was a touch bigger for the larger napkin. My mother had to put her glasses on to read what was written on it. But overall I love them. I bought these for our wedding reception in July! They are perfect and match our wedding colors perfectly. I've recommended this site to 2 other of my friends getting married this year! So happy with every product I have received from Invitations by Dawn! This product is great. Good quality napkin. The print was smaller than expected but still looks elegant. I ordered 4 different colors of napkins, 2 beverage and 2 dinner sized napkins. I loved the mint green & fuschia ones, but expected the "silver" ones to be shiney or metalic-looking. My bridal consultant asked me why I ordered gray ones. I told her they were supposed to be silver. The other color, purple, appeared darker in person than what appeared on my computer screen & also what I printed out. The napkins themselves were decent quality arrived in a timely manner. The ink color, logo, & print turned out nice. I would recommend Invitations by Dawn to a friend, just not these particular ones if you are looking for silver. Great look and perfect color ! The napkins were exactly what I wanted. They looked great and the color was perfect ! Nice quality for the price - perfect customization! Gorgeous colors! Napkins were used for an outdoor rehearsal dinner party. We got them a week ahead of time great service. Purchased for daughters wedding. Would recommend product to everyone. Product also price well, which helps. They arrived when it was suppose to and packaged very well. Arrive promptly and shipped well. Great product. Bought with 40% code which made it even better! We were very pleased with our order. We ordered champaigne glasses, engraved cake servers, and napkins for our daughters wedding, and everything was as nice as could be expected. EVEN BETTER . . . the customer service was extraordinary. When the napkins arrived the print was not the color we thought we ordered. When we called customer service they immediately made sure things were taken care of with the correct color being shipped that same day. They arrived 3 days later. We can't say enough about how efficiently and professionally this was handled. We haven't seen better customer service anywhere! These are for a 65th wedding anniversary and these will look very pretty on our pink table cloths. color exactly as seen on site. I ordered these as a extra decorative touch to my wedding. The online picture was extremely close to the actual product. I was very impressed with the items. Delivery was prompt and in good condition. I ordered 1465M monogram, which is each name and the last name initial in the middle. It looks really elegant just like that; no need to add the names again. We had planned to use them as the napkins for the dinner buffet, but then decided to do a sit-down (not me, the crazy in-laws) so we won't be using them. That's why I'm so glad the couple can now use them when they entertain and they don't look like wedding leftovers. Very pretty design. Very happy with these napkins. The color is exactly as the website shows and same with the print. Super excited to hear everyones comments at our wedding in August! I wanted a custom design and the service and help I received was great. I ordered both dinner and cocktail size napkins. The napkins arrived on time, were very attractive and well made. I would definitely use again. I bought them for my son's graduation party. I couldn't be happier with my purchase! The delivery was very prompt! I am going to use my napkins for dinner napkins. They are a good quality and not cheaply made, they should hold up just fine for my outdoor wedding reception! Best price I could find to get Dinner napkins and at a discount the price was unbeatable. Nice size and quality napkins!!! Printing very nice!! I'm pretty particular so when these arrived I was very pleased!!! Ordered these for my daughter and future son-in-law's "couples shower". Taupe is not a normal wedding color so I was pleased to find it available (it's one of the neutral colors we picked for the shower... not to "give away" the colors that will be used at the wedding! )They were personalized exactly the way I wanted. Thank you! Vey nice and best cost on napkins. They are neat and as far as I saw, no smudged ink spots. They were delivered within a week with no problems. Your service was absolutely great. Very pleased with this item. Bought black with silver design; very elegant looking. I purchased these for my wedding this summer. The quality is amazing and they look perfect. I used the yellow writing and the color is better than I expected. Have not used these yet. I ordered these for our wedding in April. They seem to be of good quality and I love the design. Absolutely LOVED the dinner napkins! I def recommend this product. Was super fast and they were beautiful! I like the colors. If you live in Canada, I suggest you request having your items shipped United States Postal Service (USPS) as opposed to UPS (the men/women in brown). The later has been known to hit you up with exorbitant rates for customs and duties when the items reach you, on top of what you have already paid for shipping. Usually when I have things shipped from the US by USPS, there are no further fees, or very little fees when the items arrive. I don't know why American companies continue to use UPS for trans-border shipping. The fees to the end user are not friendly, nor is UPS friendly about recouping those fees. PLEASE switch to USPS for ALL Canadian shipping. You will have much happier customers. I came to invitationsbydawn because a friend had recommended that I buy personalized napkins from here for my wedding. She had done so and was pleased. My friend has great standards. Customizing and purchasing was easy. Even better was the prompt delivery. I wish they had the monogram in a larger size, but I knew exactly what I was getting because the preview is so accurate. Overall I am very pleased. As a result, I have since purchased an aisle runner and ceremony programs. The customer service is fantastic and the quality is great. I would recommend this to all of my friends. Love my napkins!! We ordered the brown napkins with orange writing for my wedding and they looked perfect!! These napkins are perfect for any event! These napkins were very pretty and very durable. It was a great deal I cannot wait to use them in my wedding. We went online and found this website. We had looked and looked for others, but nothing compared to the price nor the quality. When our daughter saw them she was so excited because the monogram and color (navy) were exactly what she wanted at about half the price of others on other websites. Delivered right on schedule. Website really easy to use. Quality very good for the price. Minimum order was a little large for our event but all the extras make for good souvenirs because they were personalized. Would definitely order from this site again. I ordered these napkins for my daughter's wedding - they were very nice! We ordered the cocktail and luncheon napkins for our son's wedding.The product was received quickly, the color is perfect, and they turned out quite cute.Our only wish is the print looks kind of small on the larger napkin. Wish it could be enlarged a bit for the larger napkin.Otherwise a great deal! I'm sure they will be a hit at the June wedding! This produce was used with my wedding cake for guests for use and for souveniers. We purchased these for our wedding and they are just what we wanted :) We look forward to using them on our special day. I used these napkins for my wedding reception, I had our names and wedding date printed on them with a rose, they were beautiful and perfect!!! They worked great and were the perfect touch to the reception dinnerware!! We purchased the luncheon napkins for a brunch the day after our daughter's wedding. We purchased beverage napkins to use on the cake table at the reception. We thought you had plenty of design and font choices. Great website which we have already recommended to our friends. I loved how our names and the snowflake images came out. Nicely done.